The first castle at this site, a Norman motte and bailey castle, was mentioned in 1148 as being owned by the Bigod family. It was destroyed in 1174 on the orders of King Henry II of England because Hugh Bigod, 1st Earl of Norfolk, had joined a revolt to overthrow the King. In 1189 Henry was succeeded by Richard I of England and Hugh's son, Roger, the 2nd Earl of Norfolk, regained royal favor. He then set about building the present castle which was completed in 1213. 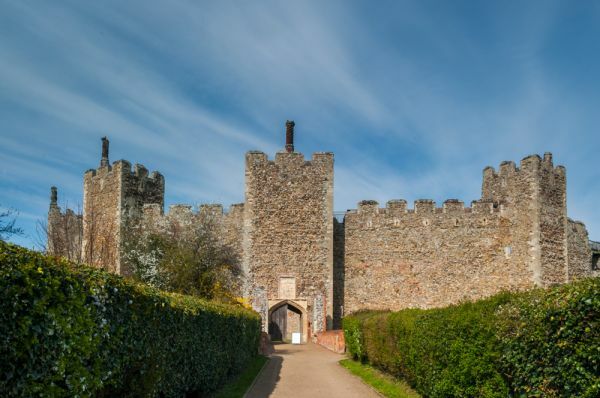 Framlingham Castle was unusual for the time in having no central keep, but instead using a curtain wall with 13 mural towers to defend the inner castle. During the First Barons' War in 1215, Roger sided with a faction of rebel barons who opposed the rule of King John. In 1216 the castle was taken by the Royal forces. Several years later the castle was returned to the Bigods. In 1270 the 5th Earl of Norfolk, also a Roger Bigod inherited the castle and undertook extensive renovations there whilst living in considerable luxury and style. Roger was heavily in debt to King Edward I. As a result, Roger led a baronial opposition against Edward's request for additional taxes and support for his French wars. Edward responded by seizing Roger's lands and only releasing them on the condition that Roger granted them to the Crown after his death. Roger agreed and Framlingham Castle passed to the Crown on his death in 1306. By the end of the 13th century a large prison had been built in the castle. 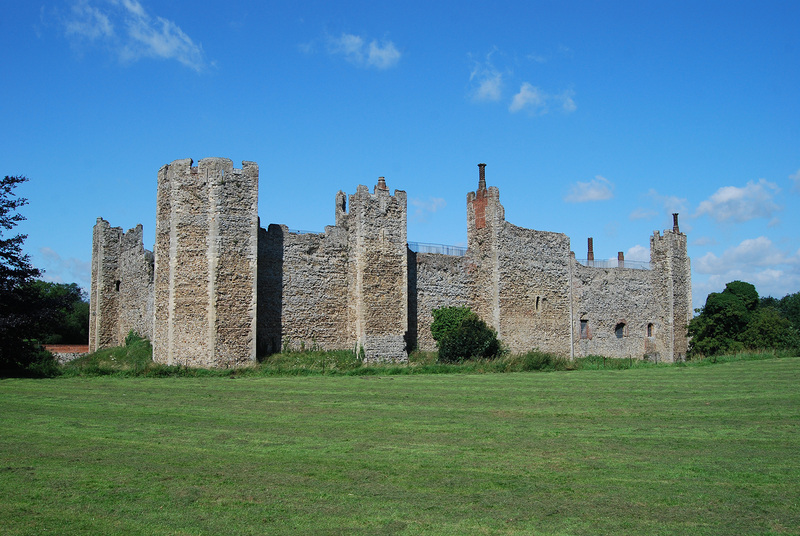 In the 14th century Framlingham Castle was given to Thomas of Brotherton, the Earl of Norfolk. Later that century the castle passed to the Ufford family, who were Earls of Suffolk, and later to Thomas de Mowbray, the Duke of Norfolk. The Mowbrays seem to have used Framlingham Castle as their main seat of power for most of the 15th century. In 1476 the castle passed to John Howard, the Duke of Norfolk. Under the Howards the castle was extensively modernized and fashionable brick was used for improvements. 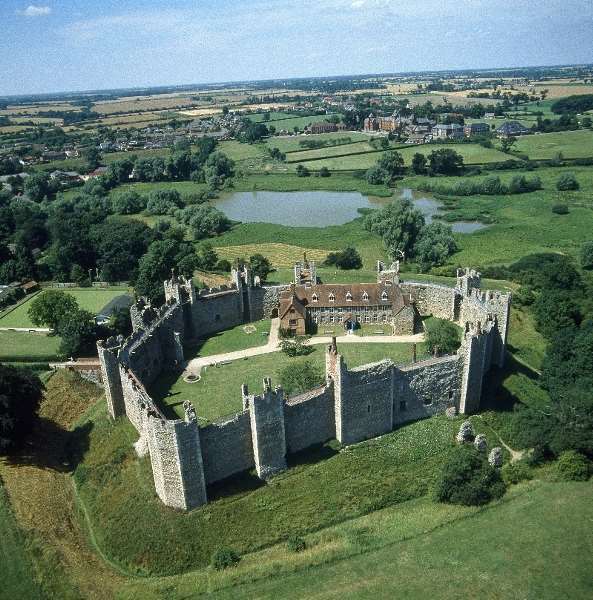 In 1485, at the end of the Wars of the Roses, Framlingham Castle was confiscated by the Crown, only to be returned to Thomas Howard, the 2nd Duke of Norfolk, in 1513. Thomas spent his retirement here and during that time the castle was expensively decorated in a lavish style. The 3rd Duke of Norfolk, also called Thomas, made far less use of the castle and repairs to the castle appear to have been minimal from the 1540's onwards. 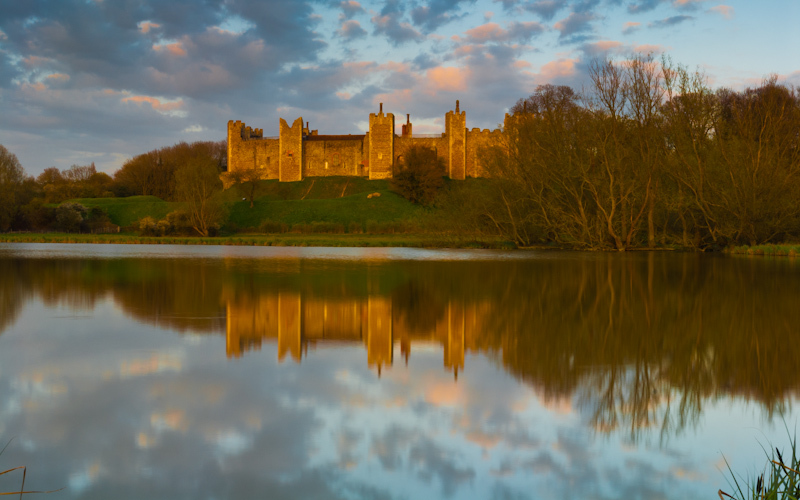 In 1553 Mary I of England gathered her forces at Framlingham Castle before successfully marching on London. After that the castle went into a fast decline. The castle became used as a prison from 1580 onwards and by 1600 the castle prison contained 40 prisoners. By 1613 Framlingham Castle lay derelict. In 1636 it went to Pembroke College through inheritance with the stipulation that all the buildings inside were to be demolished and replaced by a poorhouse. Three subsequent poorhouses were used inside the castle, the last one closed in 1839. Later it was used as a drill hall, a county court, as well as containing the local parish jail and stocks. During WW II, it was used by the British military as part of the regional defenses against a potential German invasion. At present Framlingham Castle is owned by English Heritage.